The What: Magewell has introduced the Pro Capture Dual HDMI 4K Plus LT, the newest member of its Pro Capture family of PCI Express video capture hardware. The What Else: The Pro Capture Dual HDMI 4K Plus LT captures two channels of Ultra HD video with embedded audio on each single card while reducing workflow costs and complexity with HDMI loop-through. The loop-through connections enable each source signal to be sent simultaneously to additional displays or equipment without the need for external HDMI splitters. The Pro Capture Dual HDMI 4K Plus LT features HDMI 2.0 input interfaces and supports two discrete channels of video at resolutions up to 4096x2160 at 60 frames per second. Both inputs can be used simultaneously with independent control of capture resolution, frame rate, and processing settings. 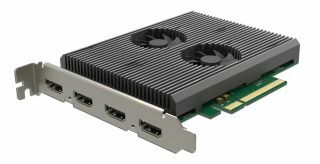 The Bottom Line: The Pro Capture Dual HDMI 4K Plus LT leverages a high-speed PCIe 2.0 x8 bus interface and is compatible with Magewell's comprehensive SDK, helping third-party developers take full advantage of the card's advanced features in their own custom software applications and turnkey systems. The company will showcase the new card in booth N1119 at NAB Show New York, taking place Oct. 17-18 in New York City. In addition to NAB Show New York, Magewell will demonstrate its latest offerings at Streaming Media West (Nov. 13-14, Huntington Beach, CA, booth 323), WFX (Nov. 14-15, Orlando, FL, booth 1222) and Government Video Expo (Nov. 28-29, Washington, DC, booth 625).